Electronics Costs > How Much Does an HDMI Cable Cost? How Much Does an HDMI Cable Cost? An HDMI, or High Definition Multimedia Interface cable, is a compact digital audio and video transmitter of uncompressed digital data. The HDMI cable is the digital alternative to regular analog standards. Today, the HDMI cable is used in many digital entertainment devices such as Blu-ray players and video game consoles. The result is a clearer picture and excellent sound clarity that far exceeds the capabilities of regular analog cables. The price of the cable depends on the quality, length of the cable and retailer you purchase it from. On average, an HDMI cable can cost anywhere from $2 to as much as $20, depending on the brand, size and where you purchase it. While there are cables that can be more in the $50 price range, most HDMI cables are going to work the same, so it is essential that you do your homework before spending three to five times more than the industry average. A larger cable, for example, such as a 100-foot HDMI cable could cost $35 to $65. Refer to our table below to see what most major retailers are charging. Another type of cable, such as the micro HDMI to standard HDMI cable, can cost about $5 to $7 per three-foot cable. Another type — a thin or slim HDMI cable — which is a lot thinner than the average cable, can cost about 30 to 40 percent more. The longer the cable, the more you are likely going to pay. MakeUseOf.com says never spend more than $10, and if you do, you have been robbed. When doing your homework, understand all HDMI cables will work the same. Amazon $7 for 6-foot AmazonBasics; however, third-party cables for about $3 to $5 can be found. What is exactly is HDMI? HDMI stands for High-Definition Multimedia Interface and is an upgrade from the analog cable using a digital signal. This signal is delivered between the two devices, and as long as the cable isn’t flawed, it should work without fail. Ever since there was a push for HD televisions, this cable has become the standard way of connecting digital equipment to the TV. These cables are a “standard,” which means every cable will do the same job, regardless of what you pay. This isn’t like a car where you’re going to get special features when you pay a pretty penny. When purchasing, pay close attention to the description or the box to see what kind of cable it is. For instance, if it says “1.3a,” then it means it can meet the specifications of all HDMI 1.3a cables. There are four kinds of HDMI cables on the market: high speed with ethernet, high speed without the ethernet, standard speed with ethernet and standard speed without ethernet. The standard cables will be able to handle up to 1080i, while the higher speed cables can handle speeds beyond 1080p. Some newer products, such as the Ethernet-over-HDMI, is a cable designed for equipment, albeit rare, that uses the Ethernet-over-HDMI compatibility. An HDMI extension cable, if you needed to extend the cable by six feet or so, could cost about $2 to $5 for another three to six feet. 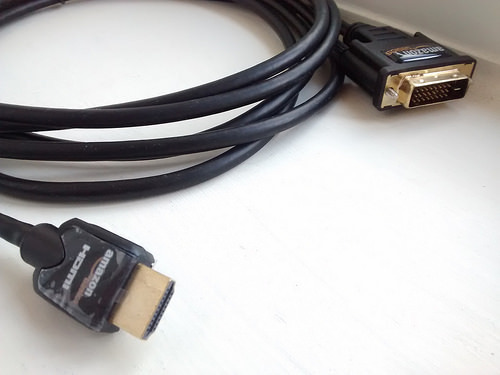 There’s no such thing as an HDMI 1.4 cable or a special cable designed for 3D or television. The picture quality will always be the same no matter how long your cable is. Standard lengths include 3, 6, 10, 15 and 25 feet, but there are cables that can be up to 100 feet long. If you see the term “CL2” or “CL3,” it means it will be coated with a special material so the cable produces less toxic gas if the cable were to catch on fire. While all HDMI cables are the same, it doesn’t mean they will work without fail. Pay close attention to the reviews online to see if any problems arise in the future after a purchase. Consider staying away from cables that cost more than $50. Stores such as Best Buy push them because of the higher profit margin, and while the employees may claim that these cables can do more than the regular cables, there will be no difference and you’ll just be wasting your money and giving those employees a bonus. As noted above, you shouldn’t be spending more than $10 on an HDMI cable.